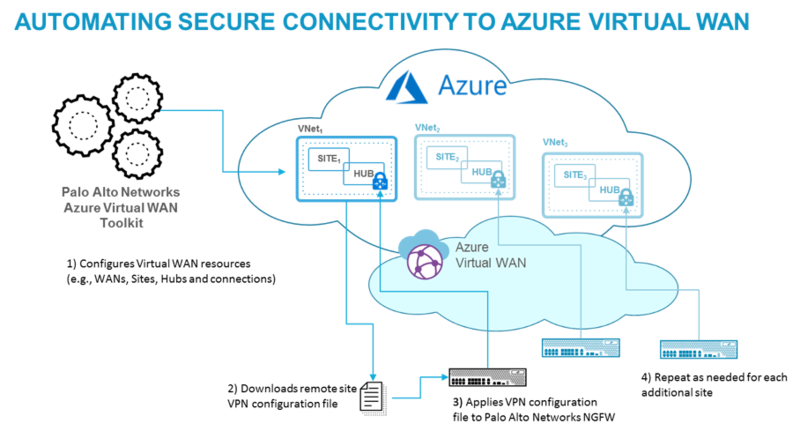 The Azure Virtual WAN is a networking service that allows organizations to use software-defined connectivity to easily link their remote and branch locations to Azure and other locations. To ensure that connections to Azure are protected from threats and data exfiltration, Palo Alto Networks has developed a toolkit that leverages the Azure Virtual WAN APIs to automate the configuration and creation of a secure VPN connection from our next-generation firewall to the Azure Virtual WAN. Using the Palo Alto Networks Azure Virtual WAN Toolkit, organizations can eliminate the manual steps required for creating an IPsec VPN tunnel for every group or location that requires connectivity to Azure. Once connected to the Azure Virtual WAN, customers will have created what is commonly referred to as a hybrid architecture where corporate locations, either headquarters or branch offices, are able to access Azure resources securely. IPsec VPN traffic flowing across the Palo Alto Networks firewall, either physical or virtualized, is controlled based on application and protected from both threats and data exfiltration. Creates and configures resources such as virtual WANs, sites, hubs and IPsec connections required to connect to the Azure Virtual WAN. Downloads the IPsec VPN configuration file required for each Palo Alto Networks next-generation firewall. Applies the IPsec VPN configuration to the Palo Alto Networks firewall and establishes secure connectivity to the Azure Virtual WAN. Organizations are adopting Azure as their sole route to market for new applications and business initiatives. Automating secure connectivity to the Azure Virtual WAN enables operations, development and IT teams to embed secure connectivity into their daily workflows without worrying about how the tasks are executed, resulting in the reduction of administrative effort required to connect to Azure resources.